Agreed! It's honestly not even worth comparing numbers since each dyno and the conditions the car was dyno'd in are very different. Unless two cars are ran back to back, it's hard to make an accurate comparison. Thanks G! It was a royal pain, my hands look like trash (covered in cuts and scrapes), but well worth it for that top end punch. Interior updates coming up soon! Last edited by Toodaloo; Wed, Aug-01-2018 at 05:33:49 AM. What’s up gang, remember me? 7 months ago, I posted an update and since then; my thread has laid dormant. Well, here’s a big for you all! I’ve been quite busy over the past few months between school and work. Oh yeah, forgot to mention; a week after my last post; I started a new job at WORKS and have been focusing on product engineering and development. Most notably: Updating our CARB exempt turbo kit for the 2017+ model years (new intercooler/mounting, charge piping, airbox mounting, along with various brackets and mounts). This has opened a world of opportunities for me and I have been enjoying the work! Now on to the M3. I’m going to make each bullet quick and to the point, as I know most of you probably won’t want to spend an hour reading through this update. My car came with a few dings and dents. Unfortunately; I added one by accidentally dropping a large 17mm socket while adjusting my torque wrench. That pushed me over the edge. The next morning, I called one of the local PDR experts to clean up the entire car. Eric from Dent Express was able to get everything out perfectly! Even those stubborn pinpoint dings came out perfectly. Stitched up some boots and an armrest in alcantara. Attended another great Radwood event. Did my first driving event in the M3 (autocross): conveniently 3 minutes from my shop. Attended Legends of the Autobahn and various events during Monterey car week. Good times! On the way home; the car started pulling hard to the left. Made a quick stop to find that the driver front wheel was down 8psi. Removed the wheel the next day to find a lovely crack in the barrel. I then had that wheel along with one other (the ugliest one with baked on brake dust and chips) replaced through APEX Thanks to Max K. : Thanks dude! I bought the car knowing the rear subframe had some rust. While I didn’t think too much about it then; after being under the car a few times I was sick of seeing it. I purchased a new subframe and stripped it down, reinforced the sway bar tabs, and painted it with epoxy paint. 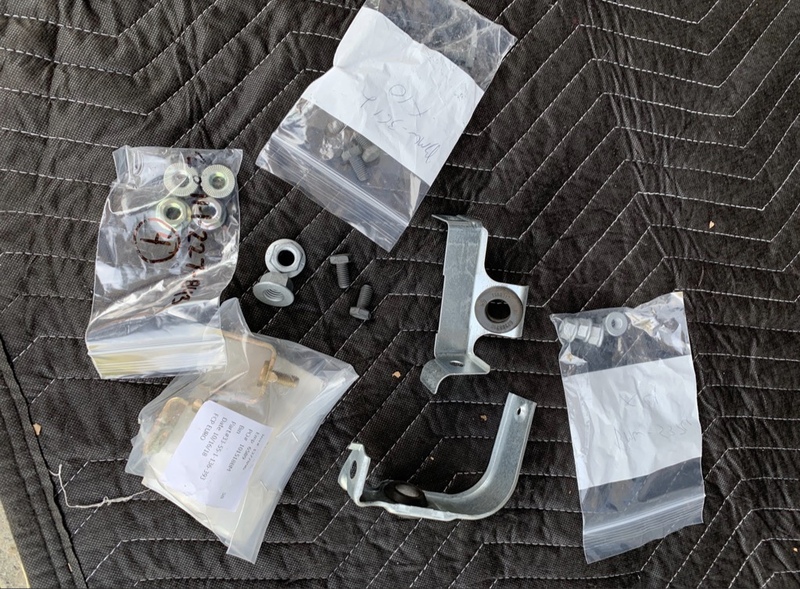 The rest of the components got the same treatment, new ball joints, Condor bushings throughout, and every piece of hardware was either replaced with new OEM or cleaned and refinished. I cleaned the bottom of the chassis and inspected for rust. Very light surface rust was found around the OE reinforcement plates; so I wire wheel’d and treated the areas! The rest of the chassis is dry! I also replaced the 3.23 LSD with a 3.38 LSD with similar miles – lockup is within OE spec, but I may build the diff down the road: for now I resealed the output shafts, diff cover, and rrefinished or replaced the hardware. While I was in there, I replaced the CSB, guibo, and fixed the transmission tunnel insulation sag with the MSportParts brackets! Lastly, I found a small crack near the trailing arm pocket and wanted to take care of it before it got any worse. 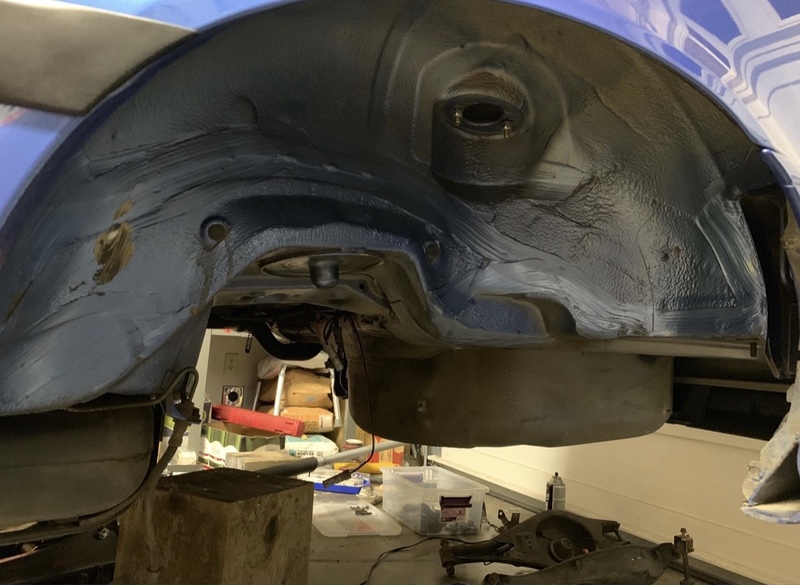 Welded in reinforcement plates, seam sealed where necessary (to prevent moisture from getting in between the plate and chassis), then undercoated the exposed metal. It was a pretty long night, but I pulled her off of the alignment rack at 4AM. Thankfully my coworker was busy with his 240 drift car project so at least we kept each other company! Removed the tint! While I love the added protection, I preffer the fishbowl look. 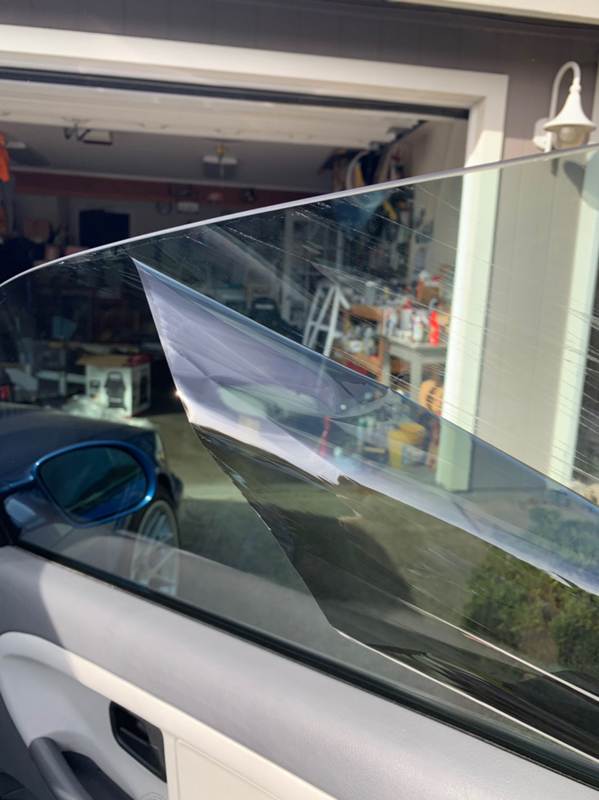 Once I can afford to do so, I’d love to install ceramic clear tint on all the windows. The last shop quoted me WAY too much. So that can wait... ha! After 6 months of waiting; a 4 point kirk rollbar in my spec popped up on craigslist. I was hoping to get away with just painting it white, however I am not happy with the results from VHT’s white epoxy paint. It’s garbage actually… Spray too light and you don’t get even coverage and a rough texture, spray heavy enough to get rid of the texture and it runs. It looks fine now, but has a few annoying runs that most wouldn’t notice (but I know about)… I’ll be removing it next summer to have it powdercoated white! Lastly, I have finally started on my interior! 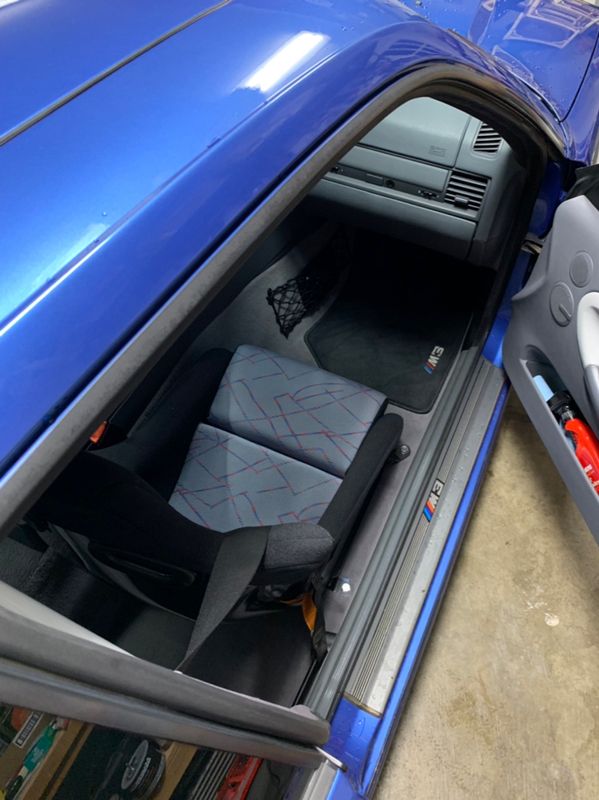 I purchased a new black cover (was originally red) for my passenger side Pole Position from Recaro and redid the center cushions in grey M-Cross fabric from ASC fabrics. Lastly, I flashed the DME with the Dinan stage 3 map and edited the redline in RomRaider to the stage 4 map limit (7200RPM). Power increase is noticeable, but not as dramatic as I was hoping for. Curious to see how other tunes stack up as I have heard Dinan’s are known to be on the conservative side. Shout out to Brett for all of his assistance throughout this project! He has been a huge part of this project and his products are top notch. We have been bouncing various ideas back and forth, so expect to see much more soon! I will keep future plans private, however I have been gathering inspiration and planning my next steps. First I will finish the interior (hopefully within the next few weeks before classes start in the spring). Next, I will focus on building a proper front splitter and possibly some additional underbody aero to balance out the GT wing. Lastly is a bit of a surprise, but if you like the words JDM and whine, you’re in for a good time! Photo quality is terrible while uploading from Tapatalk. What are your recommendations on achieving higher quality uploads while keeping a streamlined embedding process? Last edited by Toodaloo; Wed, Dec-26-2018 at 05:20:21 AM. The attention to detail is top notch, per usual. Reminiscent of your E30. I’m excited to see what you have up your sleeve for the next round of updates. Keep up the great work, my dude! Not for nothing, but you could probably use another 1/2" of rear ride height, and maybe a small spacer. The rub mark on the rear wheel well is worrying. Thank you Carlos! Next step is door panel inserts. I’m sure you remember how fun those are! Haha. Thanks for your input! That mark was from the previous wheels. The previous owner ran 245/40’s on the stock 8.5 inch contours in the rear (at this ride height). Additionally, he ran the same spec up front without any spacer. The front tire was rubbing on the coilover adjuster and the rear in the wheel well. The new wheels have a higher offset and a narrower tire (235/40), and I run less toe as well; so it doesn’t rub at all anymore. I’ll have to go in with my color matched paint and touch up that mark. I’m on my early 20’s. Raising my car would be considered sacrilege. 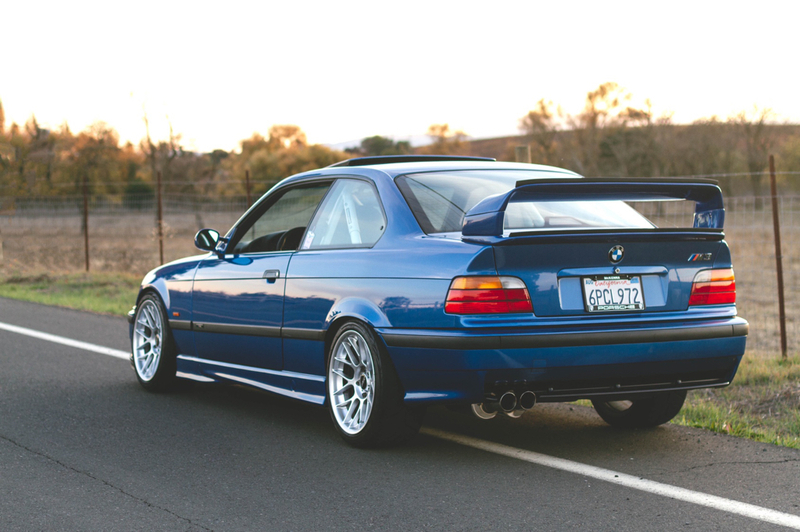 I've been on the hunt for a clean estoril E36 M3 coupe and man they are hard to come by. Sounds like you got a steal and are taking great care of this one. Hoping to find a solid driver's car sub 140k miles or so and basically want to do what you're doing! I like the look. Very nice job. ::dead:: I hope for your sake, you’re not going with new door panels.. side note: bring them over and we’ll do work w/ another Costco pizza in tow. Happy holidays to you and the fam! Thank you! The clean M’s are really going up in value. I was offered a pretty high number for my car just a few weeks ago, but cant justify it as there really are no other cars in the 10-20k price range that that excite me enough to sell. I truly feel that this is my favorite car (that I have owned) thus far; even more so than the e30! I’m sure you’ll find a great one if you keep tour eyes peeled! You’re more than welcome to check my car out at a local event, go for a ride, etc. if you’d like! Thank you, I just went through your build thread... NICE!!! Time for me to quit playing around and get on your level!